The stunning Audi R8 Spyder is now available with a new generation 4.2-litre V8 FSI petrol engine to run alongside the existing 5.2-litre V10 FSI. The new R8 Spyder 4.2 FSI quattro is now available to order priced at £95,545 OTR for the six-speed manual version and £100,855 for the six-speed R tronic automated manual. 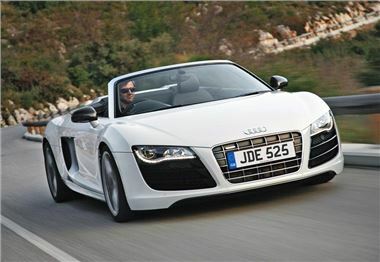 UK customer deliveries will begin in January 2011. The latest version of the high-revving, dry sump-lubricated 4.2-litre FSI V8, which will be shared with the Coupe, complies with EU5 emissions limits with the help of a new recuperation system that conserves energy during coasting and braking. Its increased 430bhp output (previously 420bhp) peaks at 7,900rpm, with maximum torque of 430Nm arriving at 4500rpm and being sustained through to 6000rpm. At least 90 per cent of this torque can be tapped into even lower down the range from 3500rpm, and from the 6000rpm peak through to 7500rpm. Inside, the R8 Spyder cabin is equipped with the same comforts as the existing V8-powered R8 Coupe, but also adds heating and electric adjustment for the Fine Nappa leather-trimmed seats, plus Bluetooth incorporating innovative seatbelt-mounted microphones which make it possible to talk on the phone even with the top down on the motorway. Metallic paint is also added over and above the R8 V8 specification.